Does this make my head look small? Now I’ve had a little problem with hats of late that only a few people know about. I was going to knit the hat designed to go with the 198 Yards of Heaven Scarf. Actually I did knit that hat but when I bound it off it was huge. There was no way it would fit anyone I know. When I put it on it flopped immediately down to my nose, below my nose actually. Said hat now resides in a bag awaiting frogging. Or maybe a winter wind will blow a cold and shivering soul onto our farm who is in dire need of a really big, and very pretty beret/tam. Some day early in the new year I cast on for a little beret for myself. I can’t say what day it was because apparently I forgot to add it to my Ravelry project folder. The pattern is the Tweed Beret from Interweave Knits (Winter 2006 issue). It’s really quite a fetching pattern and I chose a lovely stash yarn, a dark blue/black 100% worsted weight wool from Earth Arts. The yarn (along with eight other single skeins in a variety of colors) was bought several years ago when I went to that holy mecca known as The Taos Wool Festival. 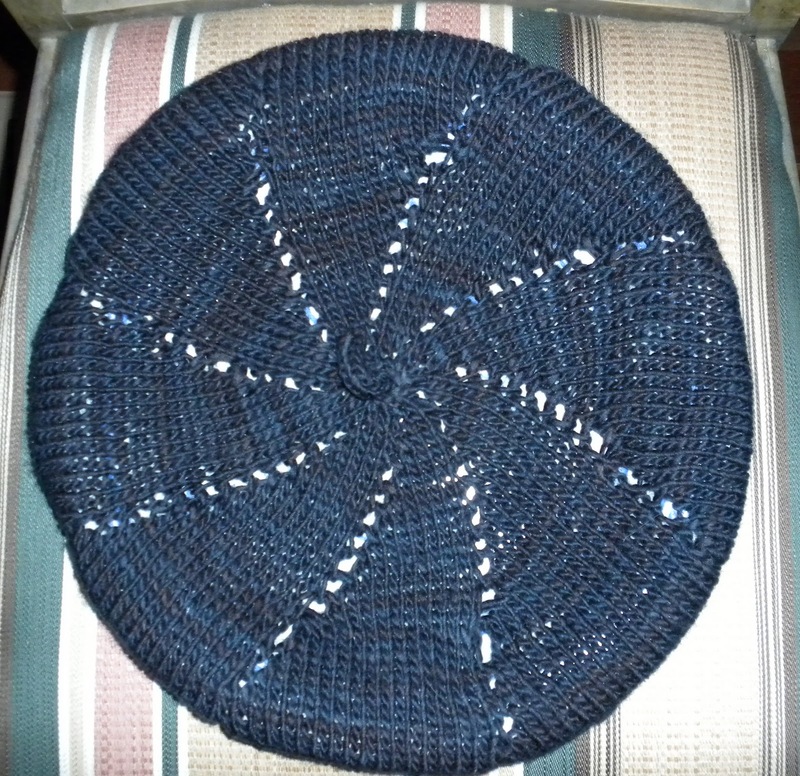 On my way out the door today I grabbed the blue beret for car knitting. Only five rows of stockinette stitch remained and the drive into Tahlequah was enough to complete the hat, or so I thought. I finished binding off the hat while Chris was inside Tractor Supply Store and quickly flipped down the visor mirror to try it on. It fit – sort of. It didn’t drop down to my nose at least but it was large enough that it wouldn’t stay in position as a proper beret should. Bobbie pins would be required. I knew I’d never remember to keep bobbie pins on hand. “What the heck” I told myself and pulled the binding out and ripped back several rounds and put it back on the needle (yes there are perfectly good times to frog!). I decreased enough stitches on one round to make it fit and then reknit the last five stockinette stitch rounds on the way back to the farm. By yardage calculation I used 80% of the skein, which is approximately 157 yards. Next time I knit this pattern I think I’ll make diameter a little smaller so it’ll fit my small noggin – I mean my petite head. I’m anxious to see what it looks like once it’s dry. edited to add: apparently I cast on this hat late in December! Here’s proof! PreviousPrevious post:On TinkingNextNext post:Pigs, beavers and dogs – when is wildlife too wild? I have the same problem – a small head… The hat came out nice, after all. Maybe it's them – not us. Surely our heads are perfectly normal sized.